l. DNA from a eukaryotic gene was isolated, denatured, and hybridized to the mRNA transcribed from the gene; the hybridized structure was then observed with the use of an electron microscope. The following structure was observed. 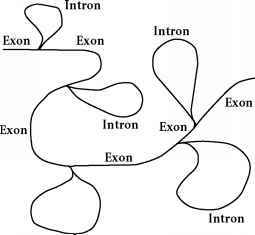 (a) How many introns and exons are there in this gene? Explain your answer. (b) Identify the exons and introns in this hybridized structure. 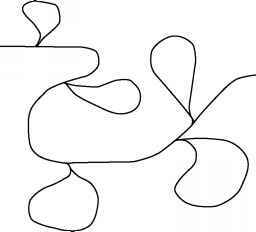 (a) Each of the loops represents a region where there are sequences in the DNA that do not have corresponding sequences in the RNA; these regions are introns. There are five loops in the hybridized structure; so there must be five introns in the DNA.